I had a couple of minutes to kill after dropping my children off at school and before I was scheduled to help set up the Friends of the Springfield-Greene County Library book sale (I’m not just a messy patron; I’m also, sometimes, a volunteer). So I stopped at the local outpost of Classic Rock Coffee for a cup of joe. If you’re not familiar with it, Classic Rock Coffee is outfitted more like a rock club than Starbucks (and this particular location has a music venue off to the side). There are black lights and music memorabilia on the walls. 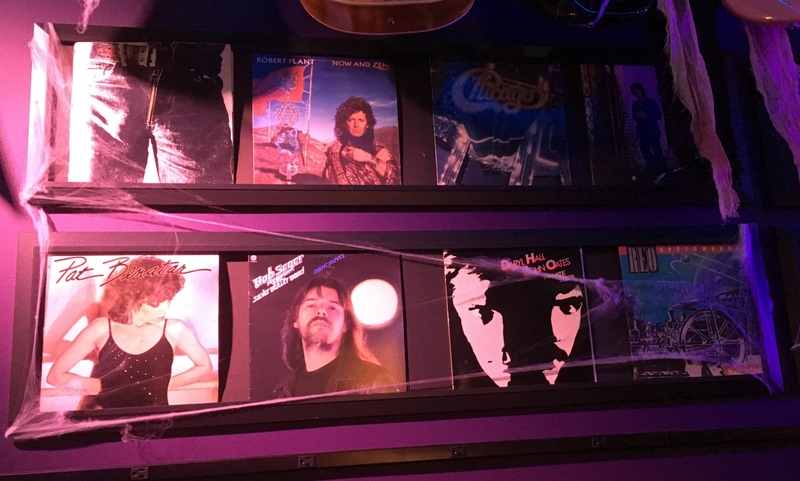 And several of the booths have a collection of classic rock album covers beside them. So, because I’m bored (or was during that interim), I’ve decided to make it a quiz. 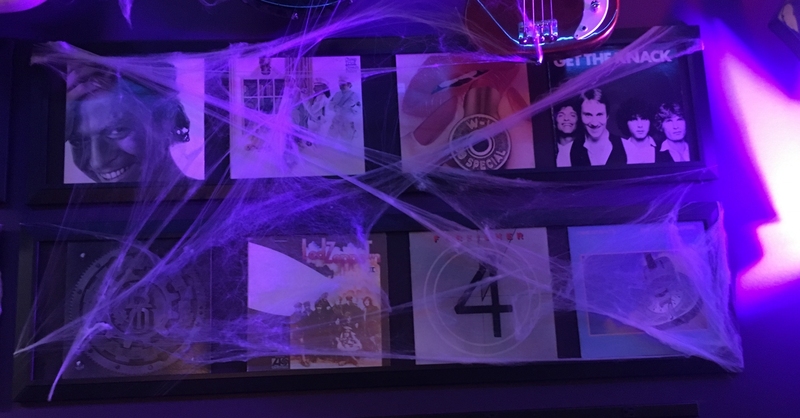 Which of the albums beside the booth do I own? 25%. Not very good. Given my other experiences at the coffee shop, this is about what I get for every booth. Note that the albums I own from the above list I first got on audiocassette, but I have since upgraded the Billy Joel to CD. Via Ace of Spades HQ’s overnight thread, we get this story: Obsolete technologies that will baffle modern children – in pictures. You know what that looks like to me? A quiz about what things Brian J. still has lying around the house. So I’ll bold the things I still have and will italicise the things that I had at one point because, hey, there are multiple text styles. Jeez, I am only 11/21. Also, note that my children do know many of these old technologies as a result. How Many Of These Six Items Do You Store In Your Garage? My insurance company has provided this listicle about What Not To Store in the Garage, and I thought it would be a great chance at a quiz. A quiz for you, I mean. You’ll notice I have not bolded or italicised things that I store in the garage. Because I don’t want my home insurance rates to go up based on my blog response to a listicle composed by a 23-year-old marketing intern from a series of other Internet postings he/she/it found. Note that storing extra fuel or solvents in your garage might also violate the contract you signed with your mortgage. What, you didn’t read it? Automobiles. These things can emit dangerous gases or, based on our marketing intern’s research in watching action films, might be extremely prone to explosions. Power tools. Which are electrocution dangers at best, death, decapitation, or disfigurement dangers at worst (according to our marketing intern, based on studious research of historical documents 80s slasher films). Anything not valuable. They’re hazardous to your marriage if you just keep random things (or so I’ve heard) and can be a fire hazard. Cigarettes. Because smoking is bad, and if you’re not planning to smoke them, you’re smuggling them, which comes with all the attendant organized crime risks. Toys from the twentieth century. No matter what they are, they are killers of one sort or another. Jarts? Books printed with lead ink? Asbestos-stuffed teddy bears? Chemistry kits with real acids? Just call out the hazmat team or ordinance disposal professionals! 21st Century Nerf Guns. Advances in Nerf technology have made it so you don’t need a BB gun to shoot your eye out. Or, more likely, your brother’s. I’ll not answer that list, either. Although if you retitle the article Whatnot to Store in Your Garage, that probably describes the contents of my garage. 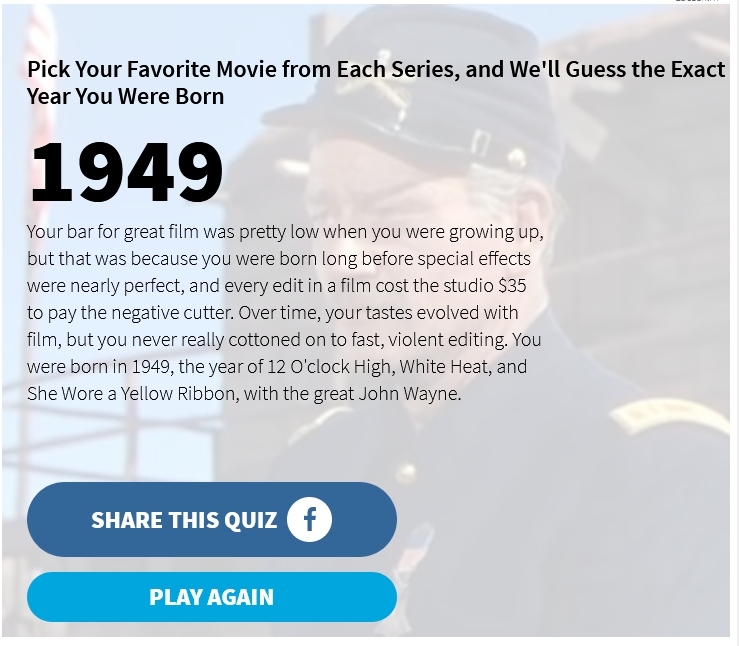 The +/- on this quiz must be a little wide: Pick Your Favorite Movie from Each Series, and We’ll Guess the Exact Year You Were Born. I am a man out of cinematic time, apparently. Of course I got that. The list included a number of series that I haven’t seen any films from (DC expanded universe, Harry Potter, The Fast and the Furious). But the quiz did not ask me about my favorite from The Thin Man series, which is a shame. To be honest, it’s either The Thin Man or After the Thin Man, although my favorite Myrna Loy movie might be The Bachelor and the Bobby-Soxer which also happens to be my favorite Shirley Temple film. As I comb through the archives, I can’t help but note how quizzes and quiz widgets were quite a bit of my blogging back in the old days, before social media companies took over to use them to mine for your personal information (to better serve you–on a platter!). I should find a way to make it so again to ensure I deliver to you, the valued reader, fresh content often even if it’s not content of the highest quality writing. But perhaps it’s more engaging. Linkbait headline is 10 Things That Didn’t Exist 10 Years Ago That We Now Can’t Live Without. Here’s the list (in descending order in the article). I’ve put in italics things I’ve used and in bold things I cannot live without. Number of things I can’t live without: 0. Number of things I use regularly: 0. I mean, I’ve used Airbnb once, and it’s still not my go-to accommodation. I’ve got Spotify installed, and I use it once in a while to try to discover new music (I found Anna Danes and Lauren Meccia on it), but the radio stations I create based on artists I like tend to play the same bands over and over, so once you’ve listened to it for a while, it’s like listening to a radio station with a small playlist). And I have an iPad, but it’s for testing purposes mostly, and it sits on the desk needing a charge until such time as I need it for testing. I’m getting to a point in my life where I’m becoming a bit of a Luddite. Technology and its toys and trinkets are not the meaning of life, and as I get older I recognize that you get more satisfaction from real life endeavors rather than endless selfies and incomplete games of Civilization. So I’m proud not to need the things in the list or I’ll die. I feel justified in trying to steer my children from devices and apps as often as possible, or else they might end up writers of twee listicles mistaking the Internet for life or meaning. Also, I really hope people can live without Tesla, especially the people who have plunked down deposits for cars that might not ever be manufactured. 4 Dickens Christmas Stories You’ve Probably Never Heard Of. Of course I have heard of them. I have an English degree, for cryin’ out loud. It helps that they were all collected in the Walter J. Black edition of A Christmas Carol that I read in 2008. Reading that book nine years ago around Christmas time might have kicked off my mostly annual tradition of reading a Christmas-themed book around this time of year. As well as how would if I were to do such thing in the StLToday.com What St. Louis jingle do you LOVE to hate? poll. Although you can actually vote for Midwest Hemorrhoid Treatment Center, but Feld is only mentioned in the teaser story for the poll and not in the poll itself. Sorry, Gimlet, you’ll have to choose another, and Johnny Londoff is not available, either. Although I would not be telling the whole story if I did not admit that I sang, “If you want TDs, say Hundley, and smile,” during the recent period when Green Bay Packers backup quarterback started games during Aaron Rodgers’ recent injury. It’s based on a jingle for Hautly Cheese. No doubt, this selection would be my children’s choice based on my revision. Someone has taken a several Best Books of 2017 lists and coallated the information into a single list that weights the books based on how many times they appeared on the best of lists. You know me; any list of books, and I make it a quiz. So here we go: Which of best books of 2017 have I read? I have put in bold the books I have read; I have put in red the books I own and have yet to read, and in underline books that I want to get someday. Locking Up Our Own by James Forman Jr.
I’ll let you, gentle reader, be the judge of whether that more indicts books published in 2017 or the taste of people who publish Best Books Of lists. To be honest, more likely the latter. StLToday.com has a quiz right in my wheelhouse. Well, it’s not a quiz; it’s a slide show of the worst Saturday Night Live skits turned into movies. Here’s the list; I’ve bolded the ones I saw in the theatre. It’s Pat: The Movie (but I did read the book which was not the movie book). Stuart [Smiley] Saves His Family (I never found Al Franken funny, even after he started doing comedy playing that character in the Senate). A Night at the Roxbury (but my friend Scott and I did not dress up for it, as we discussed). The Ladies Man with my beautiful wife. MacGruber with my beautiful wife. On our anniversary. I thought one of the films in the slide show would be Superstar! as one of the slides alluded to Molly Shannon’s character, but no. Which is just as well, because I have not seen that at all. I’m pleased to have gotten a 60% on this quiz because I have a special place in my heart for bad comedies, and most of the Saturday Night Live movies fall into this class. You have no idea. I am certain the comic did not ruin the book for me when I get around to reading it in prose. As a matter of fact, I think I’ll actually know what is going on and discover the book is not actually a music video cut-scene style collage of characters when I read the book. But as for a last comic book that I might ever read, David Copperfield is pretty hoity-toity. 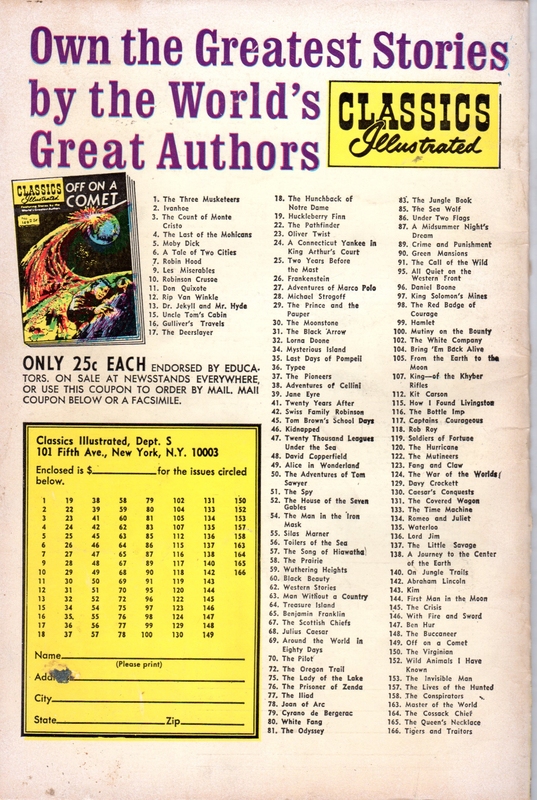 On the back, there’s a list of other titles available in Classics Illustrated editions. It’s not a comprehensive list, as the numbers skip wildly. But I took it to be a challenge to my well-readhood, so I’ve identified the books I’ve read in actual book form below the fold. I got 95% in this quiz: Can you name the missing word in each book title? I’d identify the books by name and author I’ve read in a typical quiz post, but that would kind of defeat the point if you were to try the quiz yourself. Not counting those 3, I have 4 others on my to-read shelves. 2 of them, clearly, I have never heard of. Make of it what you will, but I’d like to point out my English degree is not in literature, but in writing. Quiz: Which of the Top Selling Albums of 1980 Do You Own? Well, it’s not a quiz, Percy. But Best Classic Bands has a list of the best-selling albums of 1980, and I thought I’d list them out, quiz-style for you. Well, that’s not a lot, but I turned eight in 1980. I didn’t get my first album until I picked up a second-hand copy of Huey Lewis and the News’ Sports at a yard sale in the trailer park in 1986. Of all of the ones I don’t have now, the only ones I’ll keep my eye out for, probably on vinyl, are Linda Ronstadt’s Mad Love and maybe The Empire Strikes Back soundtrack. I won’t turn aside Back in Black, On the Radio, Christopher Cross, On the Radio, the Van Halen, and a couple of the others if I find cheap CDs of them, but it’s not likely. Funny, I don’t really seek out old albums for themselves. I pick up what’s available at book sales, garage sales, and the thrift stores, but mostly on LPs. At any rate, your mileage may vary, especially if you’re any younger than I am. Desk. Hah! I have two of them. A huge, overpriced monstrosity I bought ten years ago when I first went into business, and a smaller student desk that I bought twenty years ago when I thought I’d get into wood refinishing. As a matter of fact, I took off the handles and trim so I could jump on it right away, and I’ve left them off for these twenty (I exaggerate: 18, tops, since I bought it right after I got married and stuffed it into my hatchback at the time to bring it home). Desk chair. Also, I have two, as the movers broke the cylinder on one when we moved from Old Trees to Nogglestead almost eight years ago. A couple of years later, I figured out you could order new cylinders off of Amazon, so I repaired it. It gives my beautiful wife somewhere to sit when she stops in when I’m working, and a place for a cat to nap other times. The other place the other cat wants to nap: The newer office chair where I’m supposed to be sitting. Paper trays. I have both a horizontal tray as depicted and a file folder organizer beside it. Although the things that go onto the paper tray tend to stay there for years. Case in point: These forms to change beneficiaries on my life insurance that I’ve been meaning to fill out for several years now. After all, my mother died eight years ago, and she’s an alternate. Come to think of it, I have a second set of paper trays in my office hutch. I wonder what I have in there? File cabinet. Again, I have two: One for personal things, and one for the business. I even pull files out of the personal files to store elsewhere every couple of years. Strangely, though, not my mother’s papers, which are still in the personal file cabinet, and a half drawer of note pads I inherited from my aunt and my mother. Hanging file folders. Both file cabinets support hanging folders, although after several years they don’t hang as well. Paper shredder. When I said I ate important documents, I was only kidding! The aforementioned shredder, though, is in my office. Recycle bin. To be honest, I cannot claim this in good conscience as I remove my recycling as soon as it is ready for recycling. Supply organizer. I have a pen holder with pens, pencils, a screwdriver, and scissors; I have a little tray with paperclips and rubber bands; and I have two cubbies in reach with tape, address labels, stamps, batteries, and whatnot. So I’ll claim this even if I haven’t spent money on a professional-grade supply caddy. Computer. Yes, a few, as you might expect. I work with computers. Backup hard drive. Yes, although I haven’t hooked it up since it was prone to prevent my PC from booting. I think that was a PC ago. Perhaps I should hook it back up. I also back up to a laptop I have here, so I can just go with relatively recent data in case of emergency without having to wait for a restore. Extra set of cables. The laptop bag has the cables I need; the closet has a couple extra. And the store room, even after a couple rounds of winnowing, has backups to most things. Wireless printer. This is particularly silly. I have one, but it’s hooked up by cable anyway. Notebook or notepad. A couple grab-and-go, a couple note pads, and a couple dedicated notebooks. Check. Supplies. Oh, so many, and for so many things I thought I might want to do in decades past. Missing from this list: Tidiness and organization. But if I had all that, I wouldn’t have fodder for a category called Five Things On My Desk. Which I should revisit sometime after I clear the last five things I mentioned off of my desk. The proprietrix of ABC Books shared this link because her bookstore is on’t: The 9 Best Bookstores in Missouri!. Subterranean Books, St. Louis I went once after Sheldon sold A Collector’s Book Shop, but it wasn’t the same without Sheldon telling someone not to pull the book out by the top of the spine. Prospero’s Book Store, Kansas City My beautiful wife and I went to a number of bookstores in KC a while back, but I’m not sure that we visited this one; I’ve looked at the street view of it, and it looks familiar, but I’m not sure. We drove all over. Somewhere out in the sticks, we went to a bookstore run by one of the aforementioned Sheldon’s former employees. Yellow Dog Bookshop, Columbia I’ve never been to Yellow Dog, but I’ve been to Acorn Books, which I notice isn’t on the list, which is great because I have a twenty-year-long grudge against Ken, the owner. ABC Books Of course, I’ve been to ABC Books. The article said it’s a great place to browse on Saturdays; perhaps I would save some money if I only browsed there on Saturdays. The Book Rack, Cape Girardeau I’ve never been to Cape Girardeau, but if I had, I’d probably have visited. Hooked on Books, Springfield You, gentle reader, will remember I used to come to ABC Books when I visited Springfield before I moved to the area. I still do, but somehow not as often as ABC Books and neither as much as before I started limiting myself mostly to library book sales. River Read Books, Lexington I’ve never been to Lexington, either. Calvin’s Books, Branson We visited this book shop within the last year. Rose’s Bookhouse, O’Fallon What? This book shop is a mile or so away from the print shop where I worked for two years, and I never heard of it. But we’ll hit it the next time we’re in St. Louis, I’ll wager. That’s only four of the nine, a failing grade. At OregonMuse’s prompting, I took the Christian Science Monitor‘s Famous Literary Detective Skills Quiz. 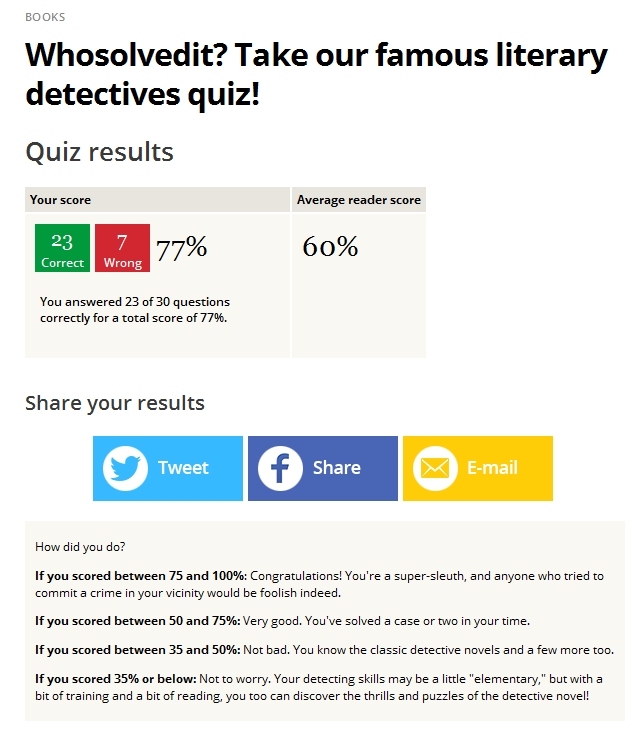 This indicates I guessed one better on the English detective novels on the computer. Note the mobile version of the quiz does not show you the right answers as you go along, which explains why I only did one better guessing the second time around instead of getting them all right to impress you, gentle reader. Someone scanned an old Parker Brothers catalog: Monopoly to Ouija: Parker Brothers Games of 1972. Quick, how many of these games do you currently own? I’d put the ones I used to own in italics, but I’ve never owned any of the others even in my eBaying days when I’d buy old board games at estate sales to sell on eBay. I’d underline the ones where I have all the pieces, but I think that would just depress me. On the other hand, I have an idea for a great 3-D printing business: Print part sets for out-of-print games. Don’t steal my idea, now. I CALLED IT FIRST. I suspect I do better than most of the population, though. And this list provides a handy shopping guide for estate sales in the future should I decide that I’m collecting Parker Brother games from 1972. And I’m just crazy enough to do it. As a matter of fact, I’d only heard of two of them: Boxing Helena because it came out while I was in college and I remember seeing the ad for it in the Milwaukee Journal at about the same time I saw Sands in Warlock late at night on cable. And I’d heard of Zardoz because Sean Connery. Most of the items on the list are brutal-looking slasher/horror bits from the 1970s directed by Europeans, it looks like. The sort of films I never thought were worthwhile. So I guess I don’t like artistic weird movies. My guilty pleasures tend to run to dumb movies. For instance, I’ve seen 9 1/2 Ninjas! more than 9 1/2 times. And I’m adding Dead Men Don’t Die to my watching list. So take my anti-film snobbery for what it is. Quiz: What Does Your Favorite Bill Murray Movie Say About You? What Your Favourite Bill Murray Movie Says About You. My favorite is Groundhog Day, of course. However, I think I’m still more a bad Phil than a good Phil, but I’m only part way through the ten thousand years’ of days. Another favorite, The Man Who Knew Too Little, might say more truth about me than Groundhog Day any way.